2) how to invest with predictable and duplicatable results. While this eBook contains powerfully timeless content, the most cutting edge investing ideas and investment opportunities can found in our free investor newsletter. 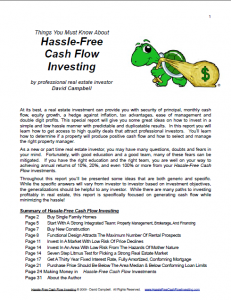 Download these free eBooks and we’ll automatically subscribe you to our Hassle-Free Cashflow newsletter. The newsletter is FREE, we never give out our list, and we promise not to spam you.